This is one of my favorite recipes because it’s so fast and easy! You just open up cans and packages and dump things in. My kind of cooking. 🙂 Also, it includes cornbread… yum! In large skillet brown beef and drain. Stir in beans, tomatoes, and seasoning. Bring to boil over high heat. Cook 1 minute or until heated through. Pour taco mixture into 9 x 13 pan. 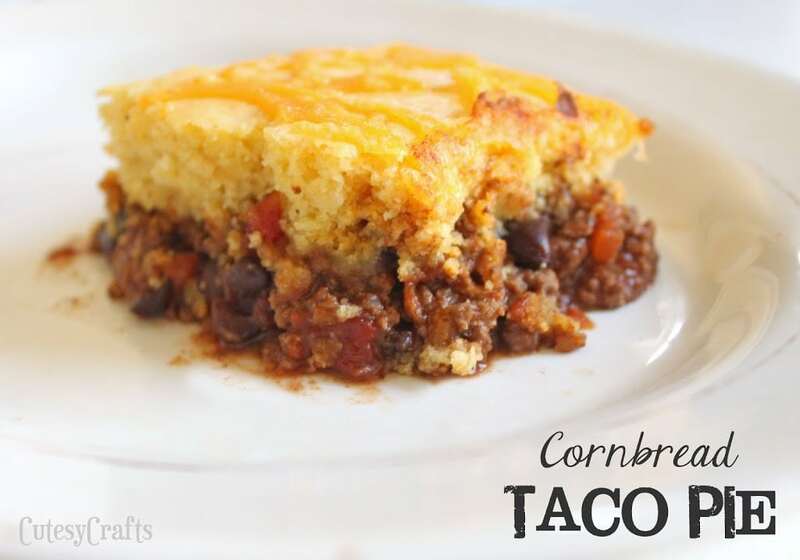 Prepare cornbread mix according to package instructions and lightly pour or spoon over the top of your taco mixture. Bake 15 minutes at 425°. Sprinkle top with cheese and bake 5 more minutes (until cornbread is done). Looks good! Why when I try to pin it…it doesn’t bring it up. I have noticed this with other items here also. Never mind..on the pin it question…I got it! Thanks! Didn’t want to miss out on this recipe! Oh good! You had me worried for a sec. 🙂 Thanks! Hi jessica! I make a version of this once it a while, yummy huh? I wanted to let you know I switched from email subscription to bloglovin. I didn’t want you to think I went away! Also, a lot of us can’t fix the no reply blogger thing…I may write about it soon. If you have time, read this & pass it around. This looks amazing! What a great dinner idea, I’m pinning this so I can make it too! I’m always looking for dishes like this and this one sounds so good! Thanks for sharing! I’m re-thinking my decision to diet! This looks so good. Thank you for sharing on Fluster’s Creative Muster Party! I am going to make this for my fiance and 5 kiddos and see how they like it, this looks great. I made this and yummmo! I have such a variety with likes and dislikes in my house and this was a LOVE for all!! Thanks for sharing! Looking forward to trying more of ur recipes. Oh, I’m so glad you liked it! My kids only eat it after I tell them there is cornbread on the top. Haha. My son tries his hardest to pick out the little tomatoes. Silly kids. Your cornbread taco pie recipe has two sizes of pans to use, 8×8 and 9×13 so what size do I use? Thank you. You use a 9×13 for the recipe. You just want a cornbread mix that is made for an 8×8 so it’s a thin layer of cornbread on the top. Does that make sense?